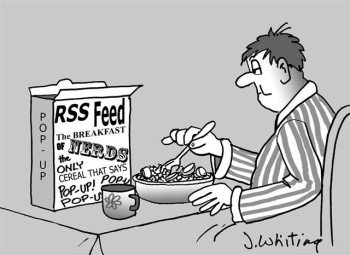 I am still learning about RSS Feeds. Below is an excerpt from an article by Mr. Michael J Ross about “Real Simple Syndication”. I found it very useful. Some people use the Internet simply for checking their e-mail messages or visiting one or two favorite Web sites. But for the majority of “Netizens” out there, visiting dozens of sites every day is the norm. Admittedly, some of these sites are visited not because they offer fresh content updated daily, but rather because they offer a frequently used service, such as online banking. But these utility sites are certainly outnumbered by “discretionary” sites that serve up the latest news from the worlds of finance, politics, sports and more. For all of us who hop from one well-worn site to another, it can easily become tedious and time-consuming to have to visit each one of these sites, determine what content we have not seen before, and filter out content on topics that are of no interest to us. Most if not all of these news junkies must sometimes wonder, “If only my computer could do this for me.” Well, it can, if those favorite sites of yours are packaging up their content in RSS format and not just as Web pages. More of them are doing so all the time, and in this article we will discuss some ways that you can do the same for your own site. But first, for the benefit of those readers who may be unfamiliar with RSS, let’s consider what it is and how it can be spotted in the wild. When it first emerged on the scene in 1999, and during the following few years, RSS was an acronym for a couple of different names. But nowadays, just about everyone has agreed that it stands for “Really Simple Syndication.” In basic terms, it is a standard and highly structured format for publishing online content, designed to be read by computer programs. Just as a newswire service will distribute its journalists’ contributions as “syndication,” any Web site can syndicate its own news. This stream of content is known as an RSS feed. As a result of using a standardized form of organizing the content, each RSS feed is thereby made easily readable by Web-based and desktop applications, known as RSS readers or aggregators. Google Reader and BlogBridge are examples of each category, respectively. All newsreaders, including these two, allow you to specify all the sites whose RSS feeds you would like to subscribe to, and how you can filter and combine the content to suit your needs. To determine if any one of your favorite sites is offered in RSS format, go to the site’s home page and look for the standard RSS feed icon. It usually is located at the bottom of the home page or up in the right-hand corner, oftentimes close to the entry fields for searching the site or logging in. All of the major Web browsers—including Firefox, Opera, and Microsoft’s Internet Explorer 7—will display the RSS icon in or near their address bars. Major news sites, probably without exception, make their content available globally to all RSS users. You may be wondering if you could do the same, and what methods would be available for doing so. It depends upon the source of the content that you want to share with the world. 03/06/09 RSS on Your Web Site: Share your site’s updates quickly and painlessly. Michael J. Ross is a Web developer, writer, and freelance editor. He creates Web sites that help entrepreneurs turn their ideas into profitable online businesses.